The First assignment that I did when following the Stanford iPhone / iPad Development course was the Simple Calculator iOS Application. In this post, I am going to share every step in making this mobile application. 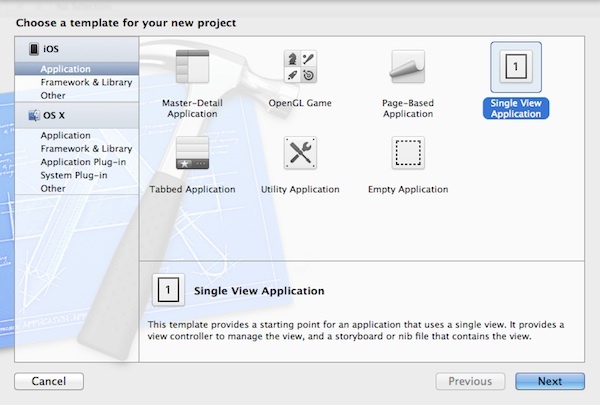 First of all, launch the Xcode and create a new project using “Single View Application“. 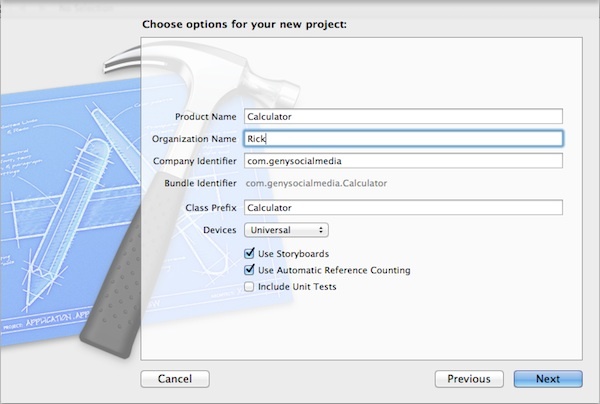 Under Product Name, you may put “Calculator”. Put your name or your company’s name under organization name. Under the Class prefix, you can put it as “Calculator”. Choose “Universal” under Devices as we will build both iPhone and iPad app. Tick “Use Storyboards” and “Use Automatic Reference Counting (ARC)“. We want to use Storyboard as it is an important technology that simplifies the implementation of MVC in iOS. Before iOS 5, the developers have to take care of every object creation and destruction to manage the memory. 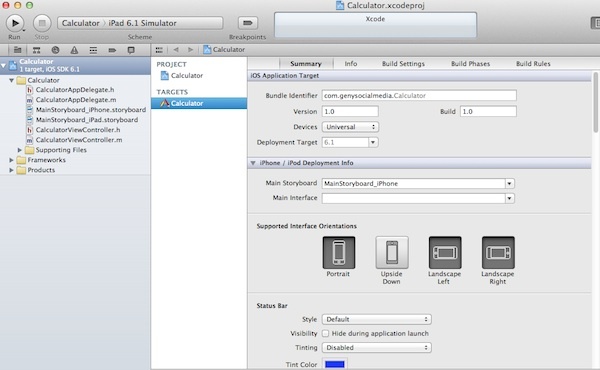 But, Apple has released a new technology calls ARC which simplifies the memory management in Xcode. Your project will have 2 AppDelegate files (.h, .m), 2 storyboards (for iPhone and iPad) and 2 ViewController files (.h, .m). .H is a header file which can be accessed by public while .M is a implementation file which can only be accessed by the class itself (private). The storyboards will contain all the views for our controllers. So, the initial project creation has given us both the view and also controller. We will create our own model later. We will leave iPad storyboard for now until the end of the tutorial. So, let’s start with the iPhone storyboard. 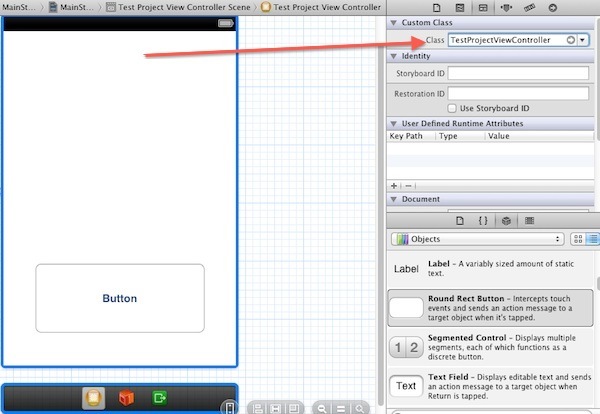 From the storyboard, you will see an iPhone size view controller object on the screen. When you click the “view” inside the view controller object, you may see the height for the view is 548. It is actually the iPhone 5 size. We can click a small screen toggle button on the bottom of the page to toggle it to normal iPhone height which is 460. We will optimize for iPhone 5 later. But for now, we just want to keep it simple and start with normal iPhone size. From my own experience working with some iOS apps developers, I learned that some of them are still using pure coding with some Interface Builder. It means that they haven’t adopt the latest technologies in Xcode provided by Apple. I can not totally blame them, it is because they are developing iOS projects that have been there for a few years and to change everything to the latest technologies is not an easy task to do. For a fresh new iOS project, it is the best to adopt the latest technologies provided by Apple. It means that we have to use both Code + Storyboard to make the iOS applications. Model: Model is always in coding. 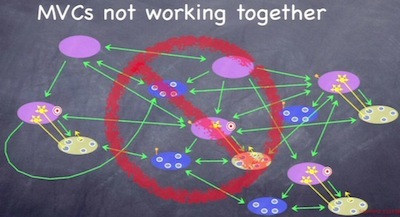 It can be in its own class (with .h and .m). But sometimes, we can code a simple Model inside a view controller. Controller: It always has its own class (with .h and .m). 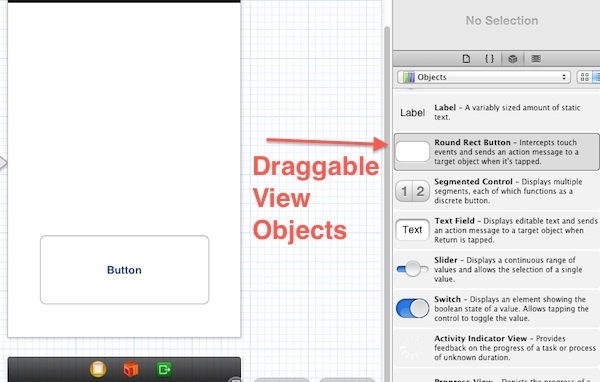 However, Apple has done a great job by making us to be able to see the view Controller in Storyboard. So, we can create a dummy (without function) view controller object on Storyboard. 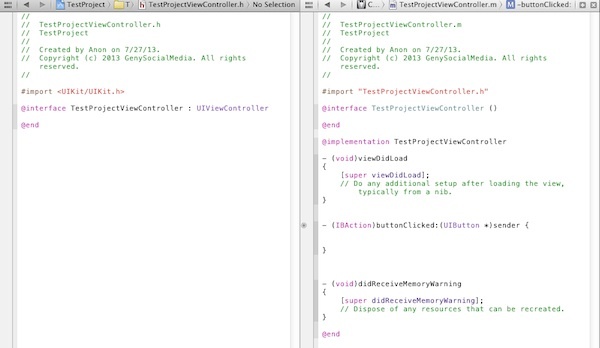 Then, we link this view controller UI Object with our own custom class file (.h and .m). We can code the functions inside the .h and .m files. 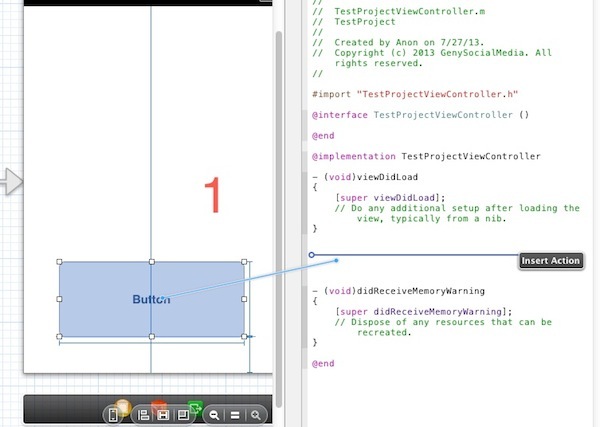 View: You can display a view using coding but it is not recommended since the release of storyboard. So, we always create view objects on Storyboard. We just drag and drop the GUI Objects into the View Controller. If we need to have special customization of object, we can subclass that object and manipulate it using code. But most of the time, we do not have to do that as the existing customization properties on the Xcode is already good enough. When a certain objects want to communication with View controller using (Target-Action), we just need to CONTROL drag that element into the .m file. 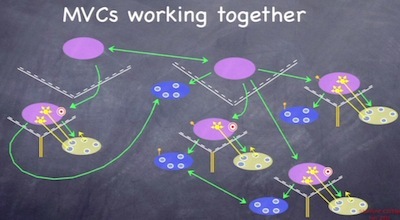 As for Delegate and DataSource, we will implement it on the View Controller files. Here is the detail explanation on Model, View and Controller with some visual explanations. 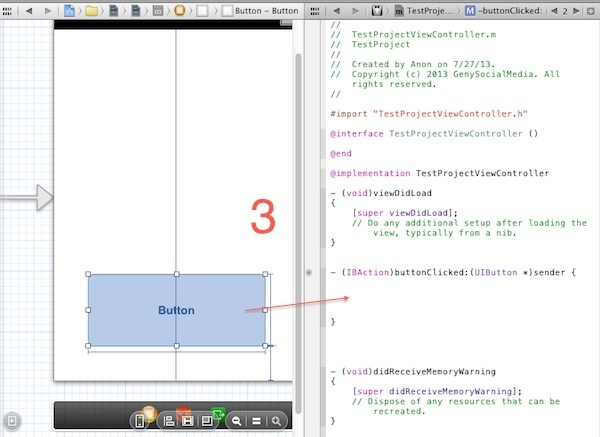 If you take a quick look at the Xcode, you will find out that there are many ready to use GUI (Graphic User Interface) Objects such as Button, Text Field, View and even View Controller. You can easily drag and drop the GUI elements into the storyboard. So, Views are mostly available on the storyboard. There are a lot of customization properties inside the view object as well. For Example, you can change the shape of a button, change the title, color, font, image, background image, shadow and more. 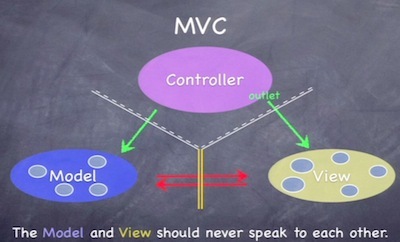 If you remember the previous post on: Programming in iOS with Objective-C Using MVC, A view can only communicate with view controller using 3 different methods and Target-Action is one of them. The below are the steps for creating Target-Action for Button to inform the View Controller when the user has clicked the button. Step 1: Control + Drag the button into the .m implementation file. Step 2: Enter a function Name and also type of sender. Step 3: A function is created and you can start to code the body of the function. For View controller, the below shows the .h and .m files. 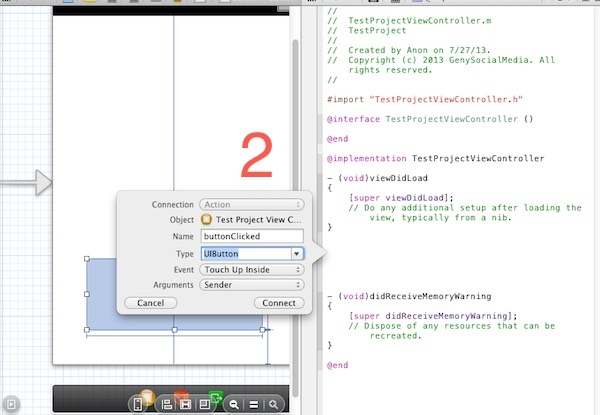 We can always link the custom class (.h and .m) with the view controller object on the storyboard. We can implement various functions using coding.